Getting Back to our Roots. . . . . The proud history of Peaper Brothers, Inc. began more than 130 years ago when William Pieper and Henrietta Wegherst traveled from their homes in Germany to begin new lives in the United States. Though William and Henrietta were both German immigrants, their lives did not cross the same path until they met in Indianapolis where they were later married on August 17, 1877. Shortly thereafter, William established a garden business that produced vegetables in hotbeds on 5 or 6 acres on what is now known as Pleasant Run Boulevard. In 1909, William and Henrietta purchased 26 acres on Bluff Road and, along with their two sons Fred and Chris, relocated the business to that location where it still operates today. Fred and Chris Peaper formed Peaper Brothers and constructed glass greenhouses and expanded their crops to include tomatoes and lettuce. This next generation joined forces with other local vegetable growers and were the first business to sign up as members of the Marion County Greenhouse Association. Many crops later and after the end of World War II, Fred’s son, Herb, and Chris’ sons, Fred and Paul, united together to continue as the third generation of Peaper Brothers. These three took the business to a new level when they began the mass-production of the root vegetable that has become synonymous with the name Peaper Brothers, the purple-top turnip. The outcome of their hard work and innovative ideas such as row cropping and the use of root cellars was an increased demand for Peaper Brothers turnips. This success led to further expansion in the form of a new cold storage system and warehouse packing facility. After many fruitful years together, medical problems befell the partners in the form of a heart ailment for Herb and a massive and debilitating stroke for Paul. Fred was unable to solely continue the day-to-day operation of Peaper Brothers and Paul’s son, Paul, and his son-in-law, Ron Kocher, stepped in to fill the void. 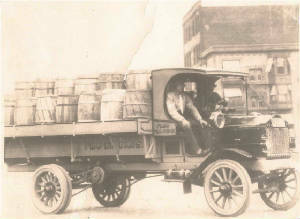 The fourth generation partnership formed by Paul and Ron allowed Peaper Brothers to continue to flourish. They incorporated Peaper Brothers in 1987 and over the past 20 years have expanded their market beyond turnips to produce crops to meet the ever-changing needs of the consumer such as a variety of peppers, kale, and squash. The fifth generation has now joined Peaper Brothers by way of Ron's son, Mike. There is an old saying that old gardeners never die, they just spade away and throw in the trowel. The last few years have seen Herb and Paul throwing in the trowel with Fred throwing his aside in February of 2007. Though none of these three great men were still owners of Peaper Brothers, Inc. at the time of their deaths, their passing seemed to mark the handing of the torch from their generation to the current fourth generation owners. It has been a time of reflection – a time to explore the rich family history in order to lead Peaper Brothers, Inc. into the future by getting back to our roots.